The Hale’s Team takes your needs and turns them into a reality, making it all about you and your needs! 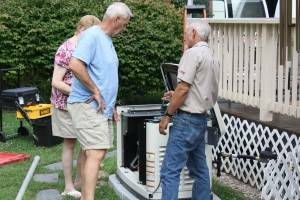 Controlling your Power daily with the Peace of Mind of a Generac Home Standby Generator! It will be the Power YOU Control! Hale’s Electrical Service has focused on Generac Generator sales, service and installation since opening the doors in 2003! 15 years of Generac Installations and over 4,000 generators being serviced, Hale’s is your local Generac specialist and professional. Selected as the last recipient of the Southeast Region Dealer of the Year for Generac in 2015, Hale’s is committed to meeting the needs of their customer base. From homeowners to builders to contractors, we have what you need and the answers for your project. Hale’s has been helping Central Virginia take control of their power for over 15 years! Over the years we have become a staple of the community partnering with many organisations and winning numerous awards. We understand that the key to our success has been strong community involvement. That is why we strive to create lasting connections while blessing Central Virginia with backup power.